Federal troops commanded by Brig. 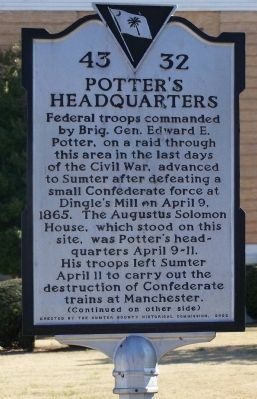 Gen. Edward E. Potter, on a raid through this area in the last days of the Civil War, advanced to Sumter after defeating a small Confederate force at Dingle’s Mill on April 9, 1865. The Augustus Solomon House, which stood on this site, was Potter’s headquarters April 9-11. His troops left Sumter April 11 to carry out the destruction of Confederate trains at Manchester. Potter’s Provisional Division, Military District of the South: First Brigade (Infantry): 25th Ohio, 107th Ohio, 157th N.Y., 56th N.Y. (2 companies) Second Brigade (Infantry): 54th Mass. (Colored), 32nd and 102nd U.S. Colored Troops. Other Units: 4th Mass. Cavalry (2 companies), 3rd N.Y. Light Artillery (Battery F), 1st N.Y. Engineers. of North Main Street and Law Range, on the right when traveling north on North Main Street. Touch for map. 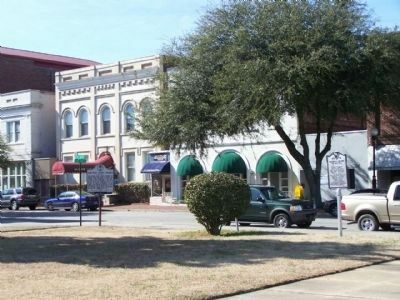 Located at the Sumter County Courthouse. 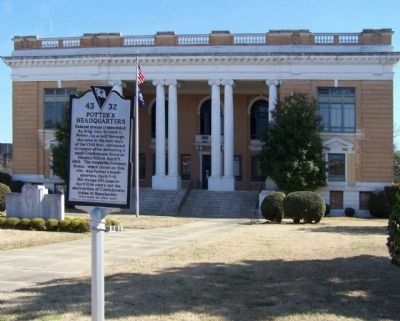 Marker is at or near this postal address: 141 North Main Street, Sumter SC 29150, United States of America. Touch for directions. Other nearby markers. At least 8 other markers are within walking distance of this marker. Sumter's Court Houses (a few steps from this marker); Sumter World War II Monument (within shouting distance of this marker); General Thomas Sumter 1734 -1832 (within shouting distance of this marker); First Baptist Church (approx. 0.2 miles away); The Tuomey Hospital (approx. 0.2 miles away); Sumter Vietnam Memorial (approx. 0.2 miles away); Sumterville Academy (approx. 0.2 miles away); Sumter District Confederate Dead (approx. 0.2 miles away). Touch for a list and map of all markers in Sumter. More. 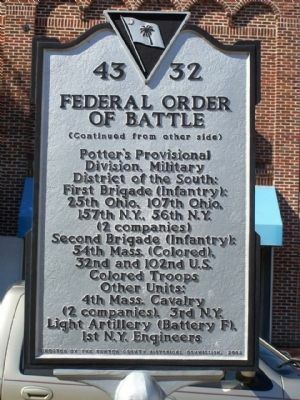 Search the internet for Potter's Headquarters / Federal Order Of Battle. Credits. This page was last revised on June 16, 2016. This page originally submitted on February 22, 2010, by Mike Stroud of Bluffton, South Carolina. This page has been viewed 1,273 times since then and 9 times this year. Photos: 1, 2, 3, 4. submitted on February 23, 2010, by Mike Stroud of Bluffton, South Carolina. • Craig Swain was the editor who published this page.